Little Dude Tolbert (hereafter referred to LDT) will be four in June, and he’s developing into quite the little protogeek. He loves all the things I’ve carefully cultivated his love for: Star Wars, superheroes, and pretty much all video games we’ll allow him to play. His interests wax and wane faster than I can keep up, but he consistently has an affection for the droids of Star Wars, and especially R2-D2. We hadn’t been on the show floor for more than an hour when LDT heard the tell-tale sounds of an R2 unit trundling down an isle. There was no need to say “hey, look! It’s R2-D2!” There was no need to point LDT in the direction. Because LDT was off like he had been shot out of a motherfuckin’ toddler cannon in the direction of R2. 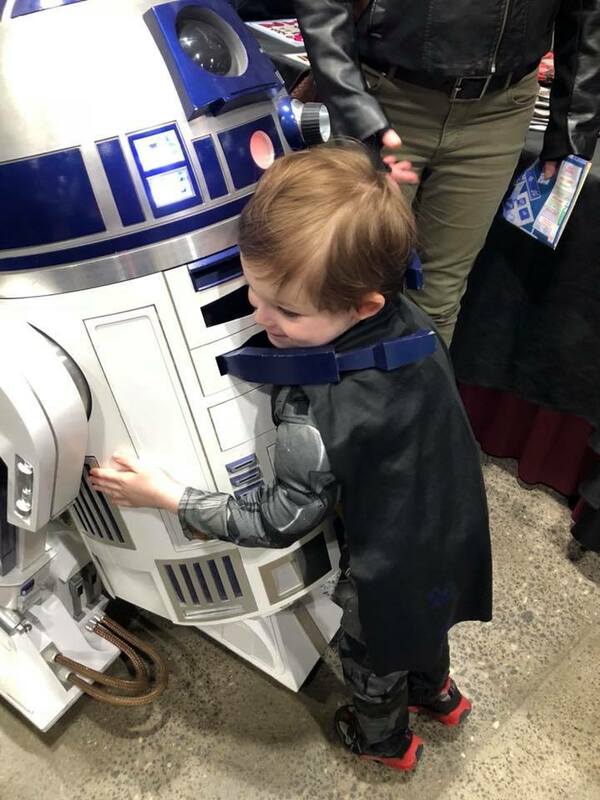 R2 is pretty cuddly for a droid as it is, but this particular one had been modified so that his front blue stripes actually unfolded like arms to give a friendly wave, or to LDT’s everlasting delight, a hug. Did I mention he was dressed as Batman the whole time? LDT was so enamored with the hugging droid that, when it was time to let them move on, he would have none of it. Apocalyptic meltdowns occurred more than once because we found it incredibly difficult to keep LDT away from the droid. The wife had a talk with the droid’s operator about how LDT was monopolizing their time. I think he forgave us, because watching the two of them hug was like setting off a cuteness A-bomb. A lot of people stopped to take photos. Later, a group called the Rebel Legion ran a Jedi Academy experience for aspiring padawans, and of course we signed up LDT for it. When was the last time you literally vibrated with anticipation for something – I’m not being hyperbolic. I mean this kiddo was shaking with excitement while waiting for his turn to battle Darth Vader and learn the ways of the Force. A stunningly well-done Hera Syndulla cosplayer helped him through the whole experience and let us know that LDT had made her day. That’s the thing about LDT – little dude has buckets of charm and charisma. (Yes, he gets it from his mother. Absolutely not the troglodyte branch of the family). It’s kind of spooky to watch, honestly. I’ve grumped and grumbled my way through past media cons, but now I’m really looking forward to the next one. Having LDT around completely changes the way I see the entire world. He makes so many things new for me, and it’s probably deeply unfair that he’s giving me ten times as much joy as I give him as the Grumpmonster Dad I find myself being sometimes. Reason number two is to stop in and see the people plying their wares, especially friends from outside the area. Moriah Hummer and her husband Paul are good friends of ours from back in our days of living in Fort Collins, Colorado. 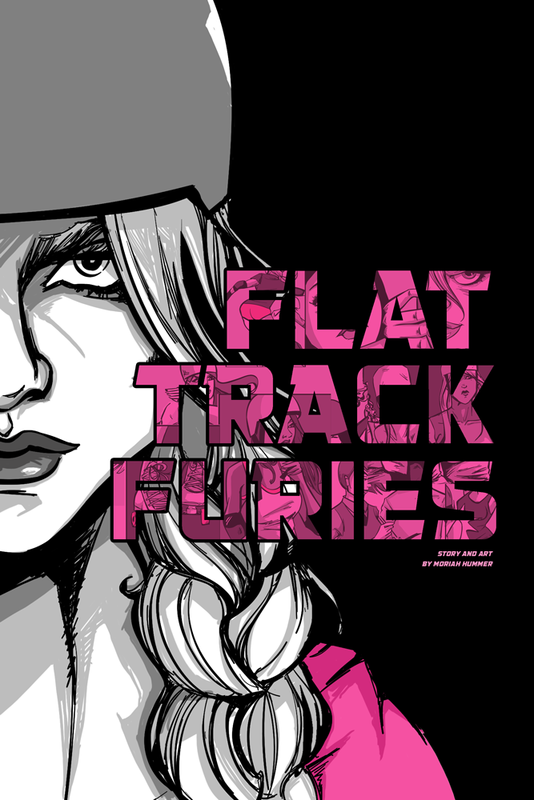 Moriah is an amazing human being and a talented artist who is the singular force behind a book you should check out assuming you love fast-wheeled fun and the color pink: Flat Track Furies. The second highlight of the show for me was sitting with Moriah and Paul and watching them work their booth. 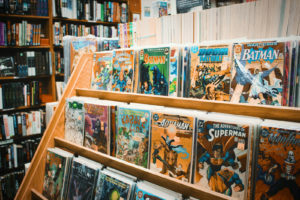 Paul runs the register and takes the money and Moriah chats with the potential customers, who are majority young women – you know, the demographic that is traditionally a bit under-served in comics. It played out over and over again that Moriah’s display of young roller derby women caught their eye, and often a befuddled father would be dragged over to buy issues one through three. Moriah has something really special going on here, and I think she’s going to be heading places. Watch her career. TheGodBeast Marty Hanson – sculpting, mold making, and prototyping. Marty had some awesome toy monsters for sale. I bought two, and it was all I could do to keep myself from buying them ALL. MayDak – a talented illustrator with some sticker work that really caught my eye and landed in prominent spots on my laptop! And a few others I failed to grab cards for. Sorry! Good food and times with great friends, parenting memories that will last a lifetime, and two enormous eyefuls of an awful lot of incredibly talented cosplay; what else can one hope to accomplish in an otherwise ho-hum February weekend? Besides the impeachment of Trump, I mean? Bet you thought I’d manage to stay non-political for once, huh? NEVER!